David Bowie (born David Robert Jones, January 8, 1947–January 10, 2016) was an influential musician and actor, actively creating music from the 1960s until his death in 2016. He traversed through many genres and styles, and oftentimes has influenced, worked with, and coincided with Nine Inch Nails. In support of his 1995 Outside album, he co-headlined the Dissonance tour with NIN, and both bands would collaborate on each other's repertoire in between sets. He also appears briefly in Closure, chatting backstage as well as performing "Hurt" with the band. Trent Reznor said in interviews that he played Low constantly during the recording of The Downward Spiral for inspiration. Incidentally, Reznor has been accused of using the main melody from Bowie's 1980 instrumental single "Crystal Japan" in Nine Inch Nails' 1994 track "A Warm Place." Reznor explained the similarity in an interview. The half-song, half-instrumental approach of Low was also a reference point as The Fragile was being written. The line "falls wanking to the floor" from Bowie's 1973 song "Time" was featured in several remixes of "Mr. Self Destruct" from Further Down the Spiral. A reversed sample from the end of Bowie's "It's No Game" runs through the background of "Pinion". Bowie also possibly drew some influence from Nine Inch Nails. 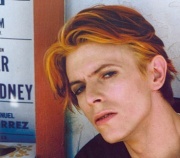 A beat similar to that of "Closer" was used in Bowie's 1997 track "Seven Years In Tibet". The beat that was sampled for "Closer" had been taken from "Nightclubbing" by Iggy Pop, a track that was co-written and produced by Bowie. Taking a cue from photographer Joel-Peter Witkin, the music video for "Closer" contains a scene of a bald woman wearing a black mask with a crucified Jesus on it. Though the influence could have come directly from Witkin instead of "Closer", a similar mask is worn by Gail Ann Dorsey in Bowie's 1997 video for "Dead Man Walking". Reznor remixed Bowie's 1995 single "The Heart's Filthy Lesson" (Alt. Mix). Nine Inch Nails (Reznor, Charlie Clouser, Keith Hillebrandt, Dave Ogilvie, Danny Lohner) made 5 remixes for Bowie's 1997 single I'm Afraid of Americans (V1, V2, V3, V4, V6). Reznor starred in the music video as a psychopathic stalker, taking the role of "Johnny" from the song. A special "Farewell Mix" of "I Can't Give Everything Away" was created by Reznor and Atticus Ross, which was then performed live by NIN in 2017. Tin Machine is an offshoot rock n' roll band that featured Bowie as lead vocalist and longtime collaborators Reeves Gabrels and Tony & Hunt Sales. Theatre 625 (1968) … "The Pistol Shot"
This page was last modified on 20 July 2017, at 21:05. This page has been accessed 54,834 times.